Thank you for your interest in Notre Dame. Please fill out this form to receive more detailed information and be contacted by a member of our admissions staff. We're sorry. The form you requested is not active at this time. For Communication inquiries, please contact Judy Detwiler, Director of Marketing and Communications. Q&A with Main Line Today. 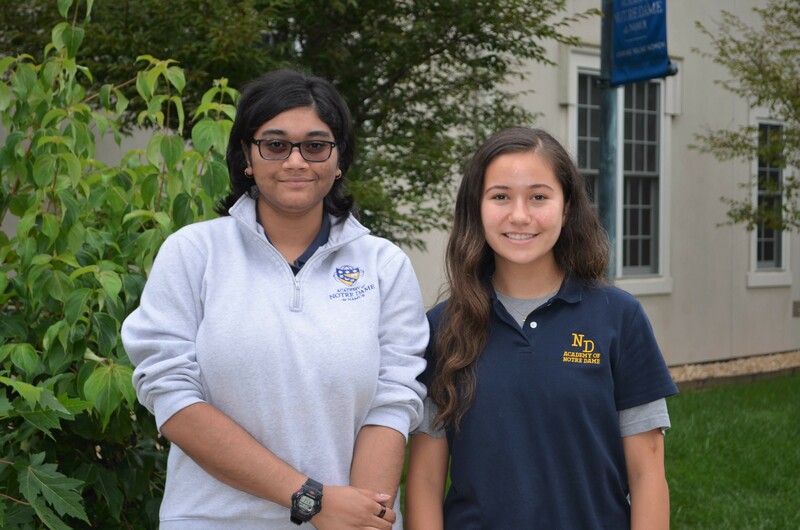 We are proud to recognize our National Merit Semifinalists Anna Miranda and Eileen Shelton. Last fall, over 1.6 million students in 22,000 high schools entered the 2019 National Merit Scholarship Program by taking the 2017 Preliminary SAT/National Merit Scholarship Qualifying Test. These students are the highest scorers in each of the 50 states and represent less than one percent of each state's high school seniors. Congratulations! We look forward to announcing our National Merit Commended students in the next few weeks. The Academy of Notre Dame de Namur, a Catholic, independent, college preparatory school, commits itself to the education of young women of grades 6 through 12 for responsible living in a global society. View key dates and deadlines. View our High School and Middle School course offerings. A comprehensive website that can help in making plans about courses, colleges, and careers. Come out and support the Irish! Click here to view the Notre Dame Literary Magazine.